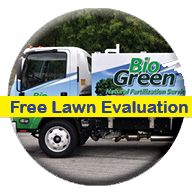 Bio Green fertilization services will make your lawn, trees and shrubs green, healthy and beautiful in an environmentally safe manner. Professional applications are applied by licensed and insured local Bio Green Service Technicians. Our lawn care company will begin the service call with a lawn and landscape evaluation by walking through your property and examining the condition of your lawn, landscape plants, shrubs, and trees. We will note and address any problems that may have arisen since your last service call. Your Bio Green service technician is always happy to take the time to consult with you about the health of your lawn and landscape and about the products used or the lawn care services provided. Our courteous and professional sales staff will help you select the perfect service plan for your landscape and your budget. The Bio Green soil-amending fertilizer is applied to your lawn. This natural fertilizer application is customized to your lawn dependent upon turf type and time of year. When the soil is cool and less active, we apply more plant nutrients. When the soil is warm and active, we apply more soil amendments, which build topsoil and soil fertility so your lawn and landscape will stay healthy and happy until your next service call. Since no lawn is the same, extra care is given to insure that the results are just what you are looking for. 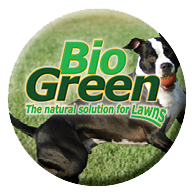 All of our Bio Green options are based around Bio Green’s own natural, bio-based fertilizer products. We follow Least Toxic Pest Control Best Management Practices (BMP’s) for weed and insect control services for lawns and landscapes; we also provide non-toxic green pest control services as well.